Welcome once again to the weekly Vanguard update! Fighter’s Collection 2015 Winter has shown the most amount of spoils throughout the seven days with a sprinkle of promos and some Granblue support which is always good. I think it’s only fair to talk about Granblue first, they’ve waited a long enough time. 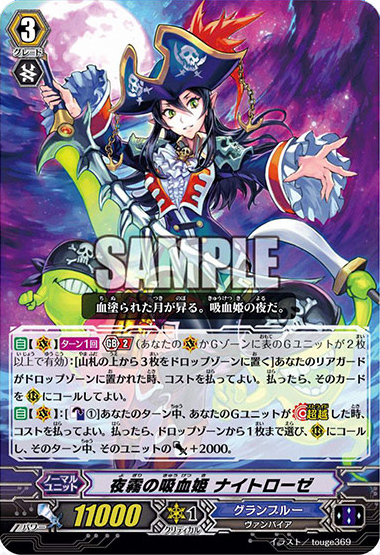 The first new card from the trial deck is their new Grade 3 boss, Vampire Princess of Night Fog, Nightrose. Many people have been waiting a long time to see this card’s ability and it shows that it was worth the wait. When a card would stride over Nightrose you may Counter Blast 1 to bring a card from the drop zone onto the field and give it +2000 power. This works very nicely with Sea Strolling Banshee to get some extra hand advantage. 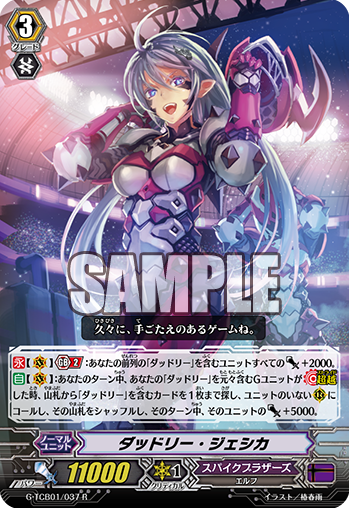 She also has a GB2 ability to bring back a rear-guard that was just retired by putting the top three cards of your deck into your drop zone. The GB2 ability will work great against clans like Kagero and Narukami but as most Granblue players may know you can’t use this kind of skill too often otherwise you will easily deck-out. 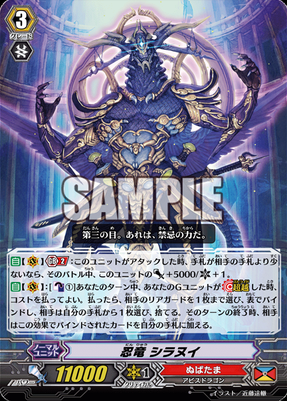 Cocytus players will know the struggle… All-in-all though this card is really good to get and maintain field advantage. A keyword named “Hollow” has been talked about too though Nightrose herself doesn’t have it so rumour has it that it will be a rear-guard ability that takes effect once a card is put into or taken out of the drop zone. Of course Nightrose isn’t alone, she also has her faithful stride fodder that even show in Nightrose’s artwork. Tommy the Ghostie Brothers are the standard “When placed on (RC), search for X” and “While you are paying the cost for Stride, this card gets grade+2.”. 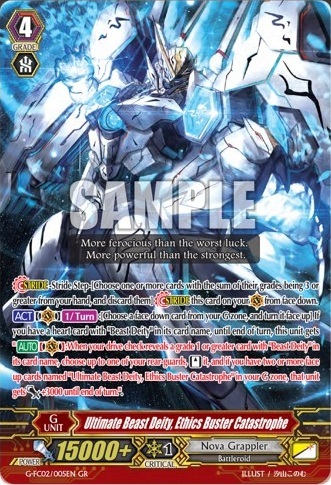 This has been shown to be a promo but the Ghostie Brothers may still appear in G-BT06 like how the original stride fodders were also promos. 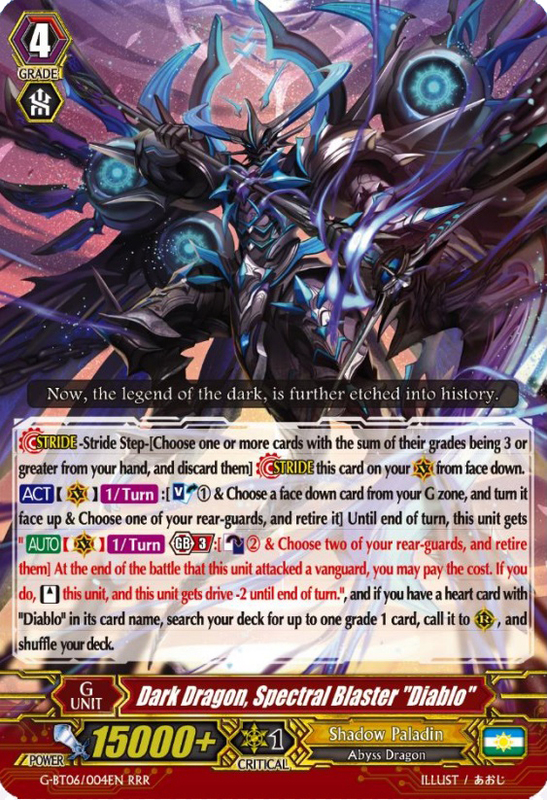 The other promo is a Grade 2 Narukami unit, Eradicator, Unruly Dragon. When this unit intercepts you can Counter Blast 1 Eradicator, as long as you have an “Eradicator” Vanguard, to choose an opponent’s unit that isn’t attacking or boosting and retire it. We have seen this kind of thing before with the Kagero unit Lizard Soldier, Bellog and it’s nice to see them make more skills related to guarding. Last week we saw Helldeity Seal Dragon, Crossorigin and this week we get his Grade 2 support in the form of Hellfire Seal Dragon Knight. With a Counter Blast 1 and Soul Blast 1 you can prevent your opponent from intercepting until the end of turn and this unit gets +2000 power for every Grade 2 on your opponent’s side of the field. This card gets power even for your opponent’s Grade 2 legion mate which is always a nice way to even the battlefield. He will be especially powerful against G era Royal Paladins due to their heavy Grade 2 support with stuff like Techgal, so RP players will really have to change up their strategy when against Seal Dragons, not that they have much choice when it comes to Crossorigin though. 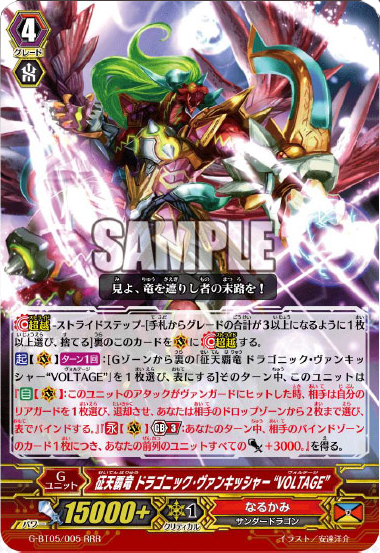 Beast Deity also get some more support with Beast Deity, Dragotwist, their new Grade 2 unit for Fighter’s Collection. He follows a pattern that has come about in the G series with Nova Grappler retiring. When he is stood back up during your battle phase you can Counter Blast 1 to choose one of your opponent’s rear-guards with power less than or equal to this card and retire it. You can use Brainy Papio and Cool Hank to get this guy stood back up and having Tribrut as your Vanguard will allow you to power up and retire two units instead, though with the downside of using up a lot of Counter Blasts. A while back Blade Wind, Sullivan was revealed as a new Blade Wing Grade 3 which planted a nice amount of hope for some more Blade Wing support and it turns out the hope grew into a card named Wings of Annihilation, Blade Wing Tibold. When Tibold is placed on the Vanguard circle and you have a heart with “Blade Wing” in its name, you put all the cards in your drop zone into your deck and then shuffle your deck. If you have fifteen or more cards in your soul then until the end of the turn all rear-guards in your front row get +10000 power, if you don’t have fifteen or more in your soul then you Soul Charge 5. 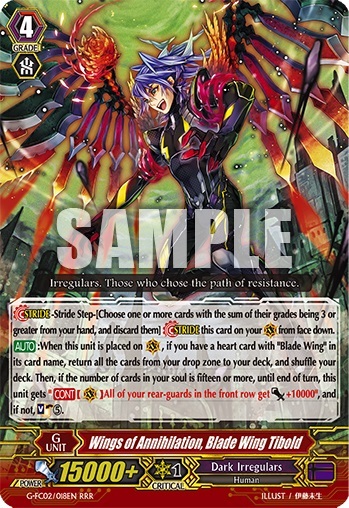 Putting cards from your drop zone into your soul is what Dark Irregulars have needed for a long time and with the addition of Sullivan it was getting a bit desperate so with this card and Sullivan coming out in the next set it becomes a great little archetype to work with within the Dark Irregulars. The first ever GR, Chronoscommand Dragon, gets his very own cross stride with Interdimensional Dragon, Chronoscommand Revolution. 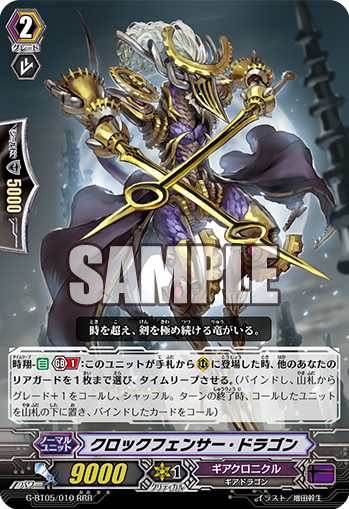 Unlike other cross strides he unflips a version of himself but Chronoscommand Dragon determines what will happen towards the end of the effect. When Revolution is placed on the Vanguard circle you may Counter Blast 1 and G Persona Blast to put all your opponent’s rear-guards on the bottom of their deck, then if you have a Chronoscommand Dragon face up in your G zone choose two of your rear-guards and put all other rear-guards to the bottom of your deck, however if you don’t have Chronoscommand Dragon in your G zone you put all your rear-guards to the bottom of your deck. The original Chronoscommand needed to hit and was a Counter Blast 2 so this is a great step up from that to wipe your opponent’s field, even with the cost of putting your own units into your deck. People’s predictions were correct about the identity of the Angel Feather stride, it is indeed a new Nociel card. Holy Seraph, Nociel allows you to choose two rear-guards to put into the damage zone at the end of that battle that Nociel attacked and if you have a Nociel heart, then you may choose two cards from your damage zone and call them to rear-guard and if they have “Nociel” in their name they get +5000 power. This allows for some strong extra attacks with the bonus that if you put Love Machine Gun, Nociel on the field then you can exchange your hand for some cards in the damage zone. Then you can also create some strong columns with Thousand Ray Pegasus. The last thing we have on our plate for Fighter’s Collection this week is the two new Tachikaze unit which gives support the Rex archetype. Our stride for Rex is Destruction Tyrant, Hellrex Maxima which has the ACT to let you retire one of your own units to then search your deck for a card with “Rex” in its name and put it into the bind zone, then you choose up to three units in your front row to give +4000 power. 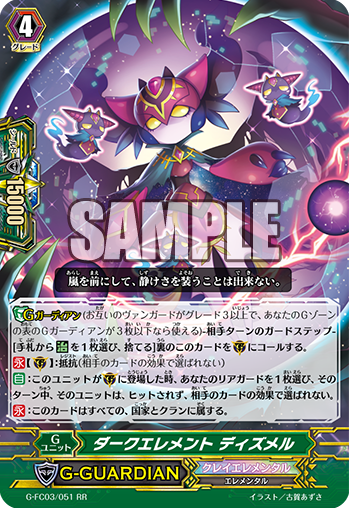 This card is especially good for Destruction Dragon, Dark Rex who can be superior called onto the Vanguard circle if your Vanguard’s attack didn’t hit, definitely an amazing boost that the Rexs needed. Our second Rex is the Grade 3 Destruction Dragon, Squall Rex. When Squall Rex is in your hand you can put him into the bind zone to give a unit +3000 power. His second ability then works from the bind zone where you can retire a rear-guard and Counter Blase 1 when a card with “Rex” in it’s name attacks a Vanguard and call Squall Rex from your bind zone to the rear-guard circle. 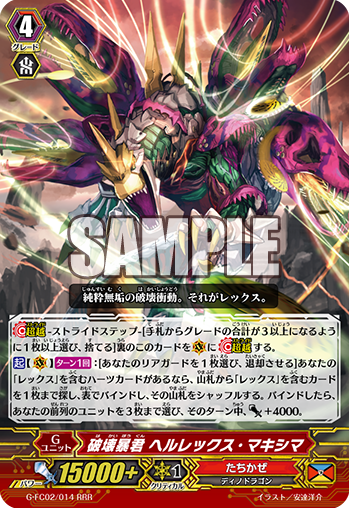 Providing you have Ravenous Dragon, Megarex on the field you could bring Squall Rex into the game while your Vanguard is still Grade 2 and get an extra attack in to give early pressure. That’s all of the cards for this week. There was a lot of good support for all sorts this week. There aren’t many cards left to reveal for Fighter’s Collection and I will continue to hope for a Jewel Knight stride for the Royal Paladin spot. Thank you for joining us this week and don’t forget to join us again next week for the cards revealed in the next seven days. Welcome back to this multi-part weekly card update for this week. In this part we will be talking about the Narukami units shown for G-BT05 as well as another special Fighter’s Collection card. To start off we have been shown some interesting support for “Detonics”. 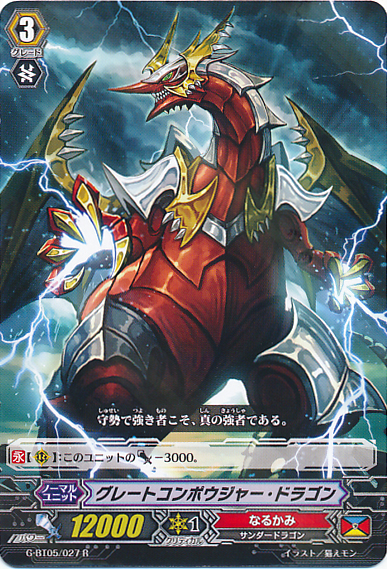 For those of you who don’t know, Detonics Drill Dragon is currently a Japanese-only Grade 3 promo who retires all fighters’ rear-guards when he is placed on the Vanguard circle with a Counter Blast 2. 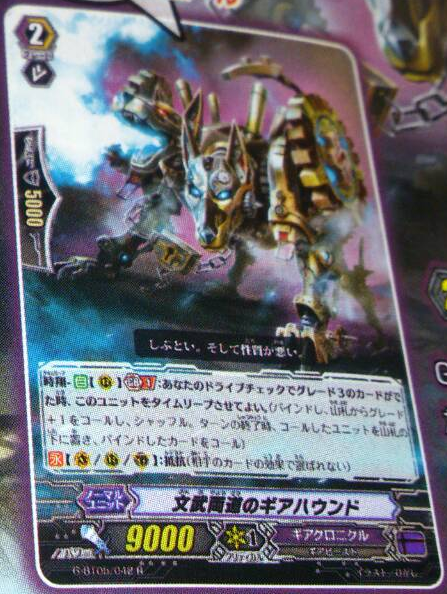 To support this in G-BT05 there is a break ride named Detonics Stinger Dragon. With a Limit Break 4, when a Narukami rides Stinger Dragon, they get the usual +10000 power plus when your new Vanguard attacks a Vanguard you can Counter Blast 1 if your opponent has no rear-guards in the front row and if you do then your opponent cannot guard with Grade 1s, and if they have no units in the back row then your Vanguard gains an extra Critical. As you can see this works really well with Detonics Drill’s ability of retiring everything. You can also use this card with Armor Break Dragon but you wouldn’t get such a grand pay-off. Another bit of Detonics support is Hammer Knuckle Dragon. If you have a Detonics Vanguard he gains +2000 power (Making him an 11k Grade 2) and he won’t be able to be retired due to skills. This allows you to still have rear-guards on the field after using Detonics Drill’s ability of retiring everything, giving more pressure to your opponent. It still seems off that they would give support to a promo like this, though maybe we will get the promo as a box topper in the next set. It’s wishful thinking but there’s still a chance. Another interesting card they put in this set is Great Composure Dragon. Originally a card only shown in the manga, Great Composure Dragon is simple yet effective. He is a 12k Grade 3 who loses 3000 power when on the rear-guard circle. This may not seem overly great but it will protect you against non-boosted rear-guards coming in for 11k while he’s a Vanguard and will really help against Aqua Force’s many but small attacks. Using Composure Dragon in a stride heavy deck will give you a good balance of attack and defence, that is if you want to choose this over Dragonic Vanquisher‘s on-stride skills. 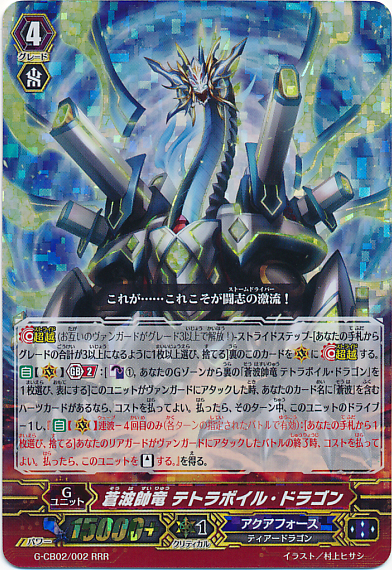 Next up we have another card that was originally manga-only, Vortex Dragon‘s Narukami cousin, Recklessness Dragon. Recklessness Dragon’s skill is simple and sweet. As an ACT you may Soul Blast 1 to have him gain +1000 power. This won’t help you overly often but it can mean the difference between your opponent guarding with one card or two. Vanquisher gets his Heart Thump Worker clone in this set with Triumph of Thunder, Reseph to give the extra power, soul, and draw. If you don’t want to use Djinn of Twofold Striking as Vanquisher’s back-up Grade 3 then Blitz-spear Dragoon is always a good option. Unlike Djinn of Twofold Striking, Blitz-spear only works on the Vanguard circle, though when he is placed on the Vanguard circle you may Counter Blast 1 and Soul Blast 1 to retire and bind an opponent’s front row rear-guard. As well as that he also gains +2000 power for every rear-guard in your opponent’s bind zone when he attacks, making him a very strong unit in late game. Desert Gunner, Koshin has a GB1 and Thunderstrike 2 which gives him +10000 shield when guarding. He’s your standard 8k power 15k shield interceptor but can also be used as a guard from hand as a little extra. Now we also have a few more Brawlers all with very similar yet awesome abilities. The first up is the Grade 1, Secret Fist Brawler, Koukon. Koukon gains +3000 power for every time an attack from your Vanguard with “Brawler” in it’s name hits. This may not seem a lot at first but when you consider Big Bang Knuckle Turbo‘s skill of attacking all of your opponent’s units it can start adding up to +18000 power! That’s a crazy back row boost. Brawler, Street Fight Dragon is a Critical Trigger that can go onto the top of the deck to give another unit the same skill as Koukon. Giving this to a 9k Grade 2 in front of Koukon will give you a great amount of power. 52k column anyone? The final unit with this type of skill is the Grade 2, Manly Leg Brawler, Teiroku. You have to Counter Blast for Teiroku’s skill and your Vanguard has to be in Legion so no Big Bang Knuckle Turbo for this card, but he does gain 5000 power instead of 3000 so you can still get him up to +20k as well as the added benefit of him having Resist. 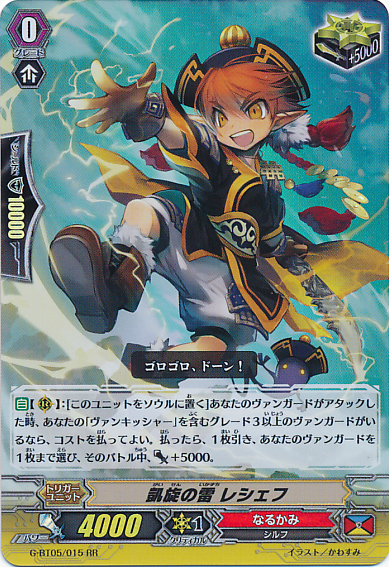 With the last of the Narukami we have the Eradicator Forerunner, Eradicator, Rare-talent Dracokid. If your Vanguard’s attack didn’t hit then you can put Rare-talent into your soul and Counter Blast 1 to give two units +5000 power. This is a nice little bonus if your opponent is on five damage so they guard your Vanguard only to discover they have to guard even more than expected for your rear-guards. The only thing to go over now is the Ethics Buster stride, Ultimate Beast Deity, Ethics Buster Catastrophe. Catastrophe has a G Persona Blast that has a “Ethics Buster Extreme” feel about it. If you have a heart with “Beast Deity” in its name and you drive check a Grade 1 or greater you may stand up a rear-guard, then if you have two or more face-up Catatstrophes in the G Zone those stood units get +3000 power. 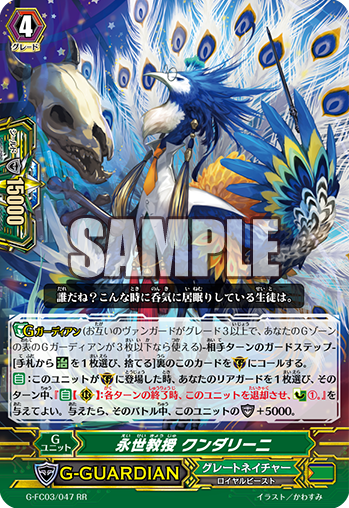 I think this is a great card to have in Beast Deitys and with a heart of Ethics Buster “Яeverse” you essentially have both Ethics Buster “Яeverse” and Extreme as your Vanguard. I would definitely run this with twelve stands to bombard my opponent. Don’t worry Blau, I’m sure you’ll return one day. Well that’s it for the Narukami of G-BT05 and the Fighter’s Collection cards. Be sure to check part 4 where I will be talking about the new cards shown for G-TD06 Rallying Call of the Interdimensional Dragon. Welcome once again to the weekly Vanguard update! 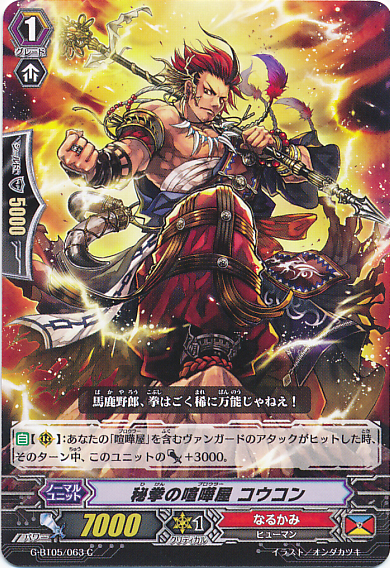 We have a huge amount of cards to get through this week from the Monthly Bushiroad reveals cards from all the different clans and even showing cards from the new G Technical Booster: The RECKLESS RAMPAGE, which gives support to the very unsupported Tachikaze, Spike Brothers, and Nubatama! To start off we have a card that every deck can use. Remember Miss Mist? That one card that was essentially a perfect guard against Legions with Grade 2 mates? Well thanks to this new little Cray Elemental everyone can have that power within their hands! If you use this little guy to guard and your opponent has a Grade 2 Vanguard then he completely nullifies the attack. Unlike Miss Mist, Heat Elemental, Juju can’t use this card to perfect guard anything below Grade 2 but being able to perfect guard most Legions is what will really draw people to the card. 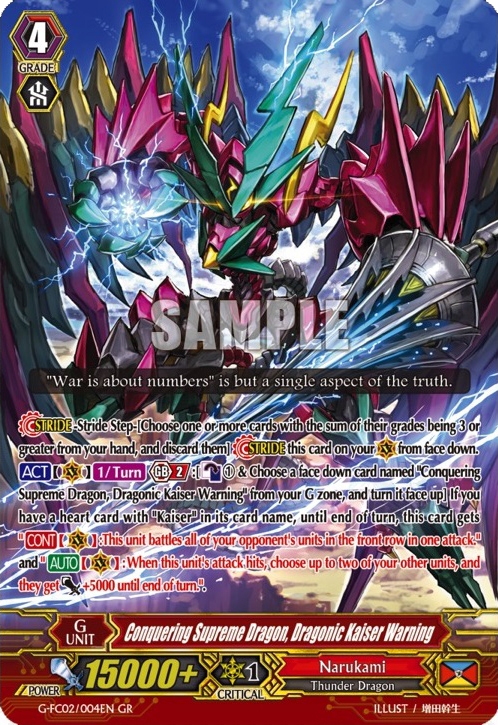 History-maker Dragon, who has been shown a lot in the anime, has been revealed to come in Trial Deck 6. 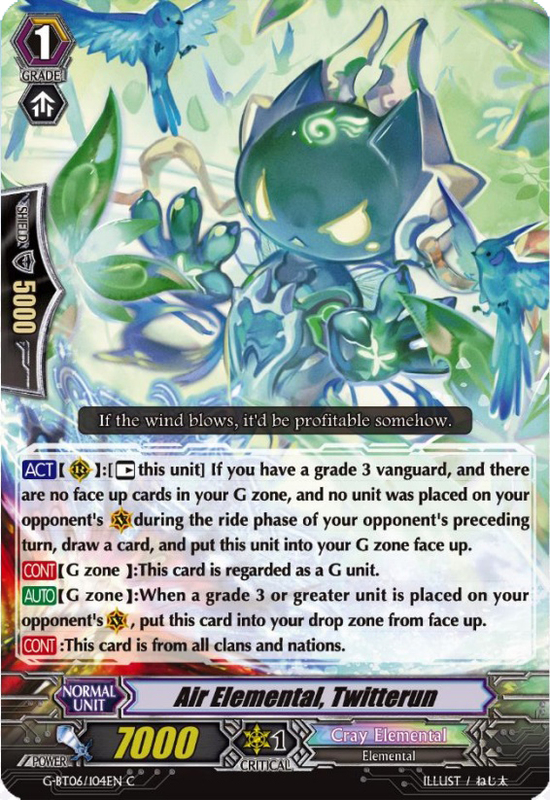 With a Generation Break 1 when he attacks a Vanguard you can Counter Blast 1 to Time Leap one of your other rear-guards (Place it in the Bind Zone and search your deck for a card with one Grade higher then that card and place it on a rear-guard circle. Then at the end of the turn put the newly called unit at the bottom of your deck and call the bound unit back to a rear-guard circle.). This is a great card for a Trial Deck and doesn’t need to be boosted unlike Amber. Another Trial Deck card is an 11k Grade 3, Classic Gun Dragon. When he is placed on Vanguard or rear-guard circle you can give a rear-guard the Time Leap ability when that unit hits a Vanguard to then choose another of your rear-guards and Time Leap it. It seems that even with just the Trial Deck cards you’ll be able to flop all your cards around the field and reap the benefits of on-call abilities and on-bind abilities. Now for the clans that everyone has forgotten about! 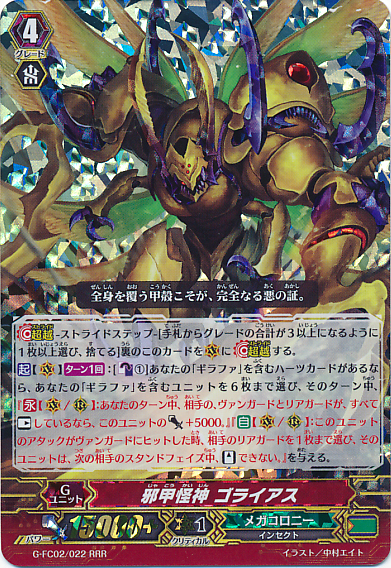 For the Technical Booster I’ll start with Tachikaze’s Destruction Tyrant, Twin Tempest. With a Generation Break 2, Counter Blast 2, Soul Blast 2, AND retiring three of your rear-guards, this Stride unit retires all rear-guards on the field. Luckily this effect happens when he attacks, giving your rear-guards a chance to attack first. Make sure not to forgot Tachikaze’s abilities of coming back after being retired, allowing for even more attacks and an easy fill of your field. It’s a very heavy cost but I’m expecting a Grade 3 with an on-stride skill of Counter Blast 1 to call two units you retired back to rear-guard, as well as perhaps some units that are free to call back but have a Generation Break 1. An odd but cool Grade 3 that Tachikaze gets is Ancient Dragon, Spinocommando. He has a good ol’ Limit Break 4 which allows him to retire one of his “Ancient Dragon” rear-guards at the end of the turn to choose a Grade 3 from your Soul, Ride it, then put Spinocommando from your Soul into your hand and then draw an extra card. On the turn that he is placed on the Vanguard Circle he can also call an “Ancient Dragon” that was put into the Drop Zone to a open rear-guard circle with a Counter Blast 1 with “Ancient Dragon” in it’s name. Getting Spinocommando back in your hand can either be used to Stride, help to activate his second skill every turn, or even just for for extra rear-guard power, the draw is always nice too. A great card to use this with would be the Break Ride, Ancient Dragon, Spinodriver, to give you +10000 power and +1 Crit every turn! 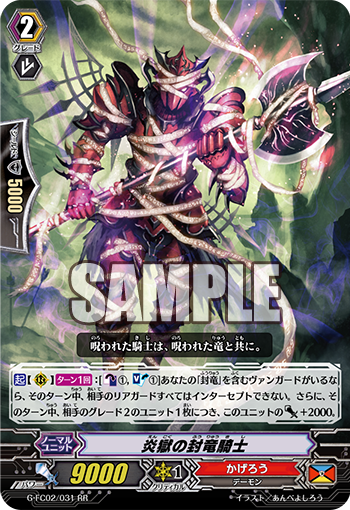 The strider for Nubatama is Stealth Dragon, Shiranui, and as always with Nubatama this guy will be messing with your opponent completely. With a Counter Blast 1 when you Stride over this guy you choose one of your opponent’s rear-guards and bind it, then your opponent has to discard a card from their hand. 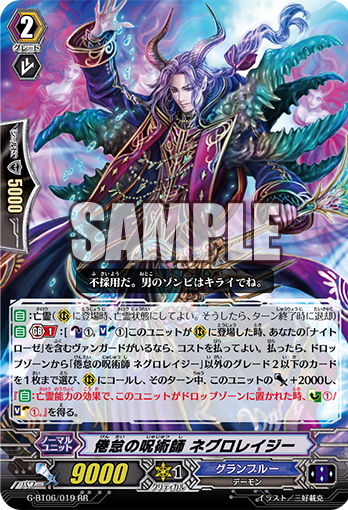 With a hit from Rikudo Stealth Dragon, Gedatsurakan you will be able to discard two cards from your opponent’s hand which can easily make a big difference for what your opponent can do on their turn. If your opponent manages to get their hand size up again then that can still work in your favour. With Shiranui’s GB2, if the number of cards in your hand is less than your opponent’s, then he gets +5000 power and +1 Crit! From this card I have a lot of hope for the future of these demon-dragon-ninjas. The Spike Brothers card that has been shown, Bulldozer Daub, has also shown off Spike Brothers’s new keyword, “Charge”. A unit goes into the Charge state when they are placed onto a rear-guard circle due to an effect, then at the end of the turn it goes to the bottom of the deck. In exchange for them going back to the deck they are gifted with powerful abilities which Bulldozer Daub will be showing off. He’s a Grade 3 with a GB1 that, when he’s in Charge state, gains +10000 power until the end of the turn. This is an amazing back-up Grade 3 and may finally be the one to replace Juggernaut Maximum. I’m sorry, Juggernaut Maximum, though I’m sure many players would thank you for helping them since the very beginning. The new Susanoo Stride, Destroyer Dragon Battle Deity, Kamususanoo, has caused a fair bit of disappointment to the fans of Oracle Think Tanks. With a G Persona Blast he gains the ability that, when his attack hits, look at the top two cards of your deck and choose one to put in your hand and then put the other at the bottom of your deck. He also gains a GB3 which gives all the rear-guards +2000 power. The main issue people have is that the first part of his skill needs his attack to hit and you have to pay the cost before he’s hit. Only drawing one extra card is a bit small for a RRR Oracle Think Tank Stride but I feel the second part really helps OTT. 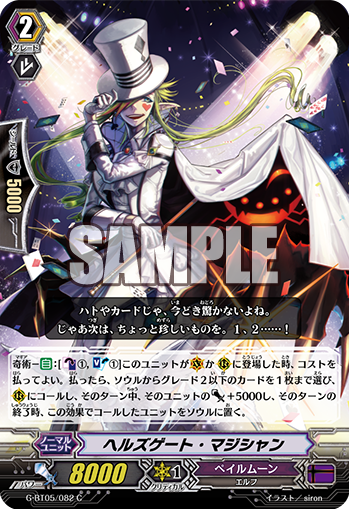 Giving +2000 power to all rear-guards will make Silent Tom that much better and with a boost from the new Imperial Shrine Guard, Sumiyoshi you can get Silent Tom to 21k power! 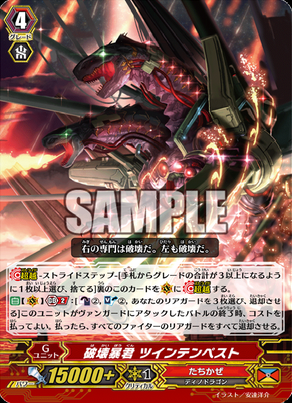 More support for Susanoo comes in the form of Imperial Shrine Guard, Akagi which is the Glimmer Breath clone. When he’s placed on rear-guard circle with a GB1, CB1, and SB1, with a Susanoo Vanguard, you can look at the top two cards of your deck, choose one to put in your hand, and then he gains 2k power. Some people may still want to use Diviner, Kuroikazuchi instead but this guy can by nice for the extra power and getting a choice between two instead of just drawing one from the top of your deck. People may be disappointed with Susanoo but when it comes to the Magus’s it’s completely the opposite! One Who Sees the Stars, Globe Magus is the Stride unit for the Magus sub-clan and does what they do best on a much larger scale than ever before. 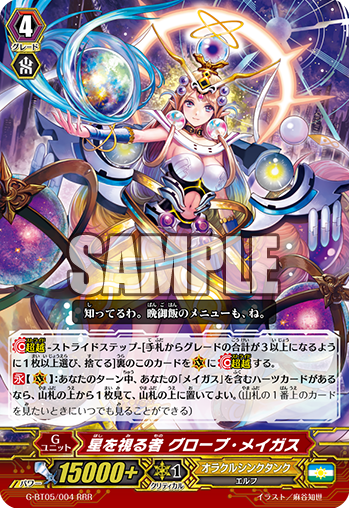 If you have a heart with “Magus” in it’s name Globe Magus gains a Continuous ability that allows it to look at the top card of your deck at any time as many times as you like while she’s the Vanguard. This will be great for Stellar Magus to easily be able to draw extra cards when she attacks, and it’s always nice to see if you’ll be getting triggers. You can use this effect just before she goes back to the G Zone to see what card you would be getting if you were to take damage on your opponent’s turn. Flip Crooney is a nice little generic Grade 3 back-up for Oracle Think Tank. With a GB1 and Oracle (Having five or more cards in hand) if his attack hits you may look at the top two cards of your deck and put one into you hand. With no cost this a sweet ability and having Susanoo’s power boost you can make a pretty easy 21k column with him. Beam Shower Turtle Allows for the strong power to be accompanied with strong defence. When he is placed on the guardian circle you may Soul Blast 2 to give him an extra 10k shield, making him a 15k defender. It is likely that there will be a few cards in your Soul that you don’t need so the cost of this card doesn’t seem too bad. The last of the Oracle Think Tank is Magical Calico. He is a new Forerunner with GB1 and Oracle and the ability to go into the Soul and drop one card to search for three cards in your deck, reveal them to your opponent, your opponent then chooses two of the three cards to put into the drop zone and the last one goes to your hand. This may be useful for Legion decks but the GB1 kinda makes it a little harder to use. Like Susanoo, Dragonic Vanquisher has had his Stride Fusion revealed. 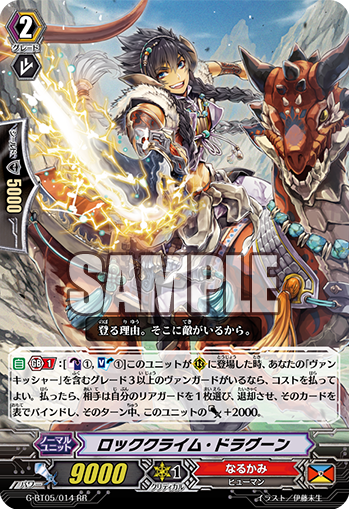 Conquering Supreme Dragon, Dragonic Vanquisher “VOLTAGE” can be a great alternative for Conquest Dragon depending on how your deck works. With a G Persona Blast he gains two abilities, the first one being an on-hit ability where your opponent must retire one of their rear-guards and then you choose two of their units in the drop zone and bind them. The second one is a GB3 that gives your front row +3000 power for each card in your opponent’s bind zone. This can add up for some ridiculously strong units in the front row but does require some good preparation first. As well as having Rockclimb Dragoon and Voltage Horn Dragon, there is also a forerunner that binds. 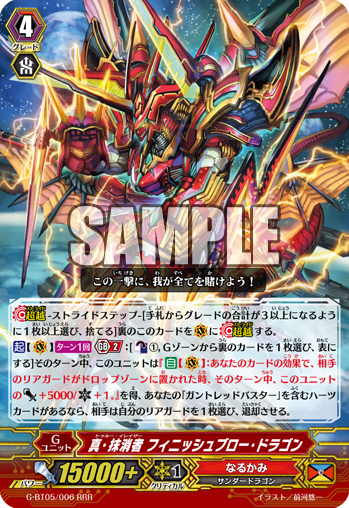 Wildrun Dragoon has a GB1 that allows him to go into the soul to let your opponent choose a card from their drop zone to bind and then if you have a Thunder Break 2 you can give a rear-guard +5000 power. 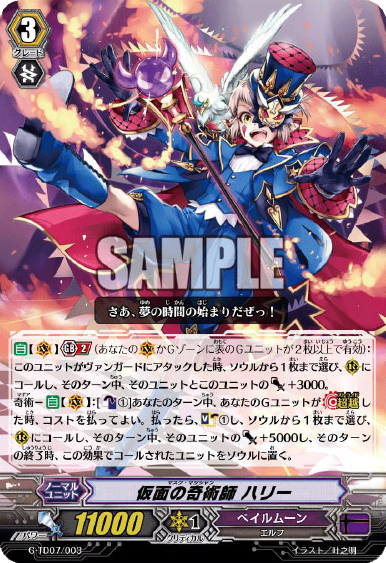 Dragon Dancer, Bernadette is a 6k Grade 1 with a Thunder Strike 2 that allows for a Soul Blast 1 to give the boosted unit +3000 power and if the attack hits you can Counter Blast 1 to have your opponent retire one of their units and then binds it. All this power and binding will rack up to help for a final push with “VOLTAGE”. 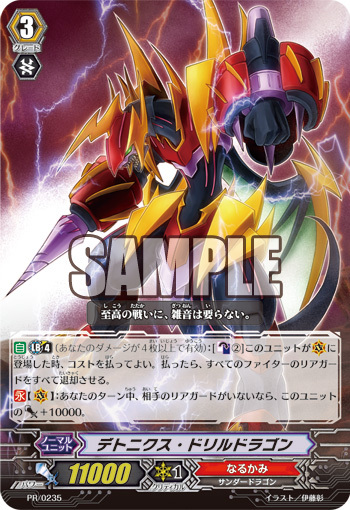 The new Eradicator Stride seems like a powered up version of Gauntlet Buster Dragon which is most likely why they work together. 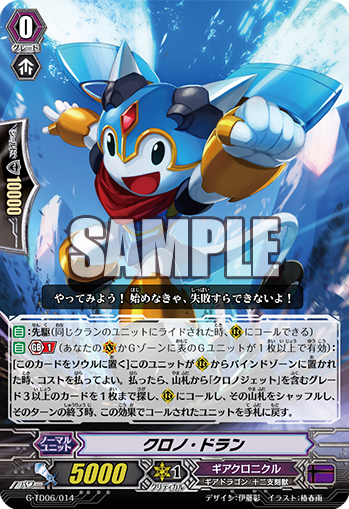 True Eradicator, Finish Blow Dragon gets the fairly cheap cost of Counter Blast 1 and G Persona Blast to gain the ability where he gains +5000 power and +1 Crit for everyone of your opponent’s rear-guards that are retired on that turn. As a bonus, if you have Gauntlet Buster as a heart, he gets to retire a unit when you pay for this skill. This can be used with so many different cards to maximise the effectiveness such as Cho-Ou, Voltage Horn, Koenshak, Cho-Jun, Saucer Cannon Wyvern, and more. Eradicator, Angercharge Dragon can also help give a power boost to Finish Blow. When Angercharge is placed on a rear-guard circle you may Counter Blast 1 with “Eradicator” in its name to take the top card of your deck and put it into your damage zone. If that card have “Eradicator” in it’s name then your opponent must retire one of their cards. At the end of the turn you heal a card in the damage zone, meaning you can heal the card you Counter Blasted. This is a good back up but risky and if you’re at five damage he becomes useless unless you want to lose. Clown Demonic Dragon, Lunatech Dragon allows for a strong first Stride for Pale Moon. You may G Persona Blast when he is placed to give him the effect where every card that comes out from your Soul onto a rear-guard circle gains +2000 power. Considering your units will be coming in and out of the Soul like nobody’s business this extra power will really help, especially when you can only bring a couple out so your front row will be able to hit without needing a boost. If you then have a GB3 he gains an extra critical just like that! This is a pretty solid card but we’ll have to see what the new Harri Stride can do before we can really judge Lunatech. Darkside Princess is a Grade 2 Pale Moon unit allows you to give it +5000 power and if you do then she is sent to the Soul after the battle. This card works really well with Moonlight Melody Tamer, Betty, allowing you to call a new unit with Magia where Darkside Princess once stood. Through Betty you can then call Flying Peryton who has Magia and GB1 for when he is placed on a rear-guard circle you have Soul Charge 1 and then you are able to choose a card from your Soul to call to the rear-guard space in the same column as this card. It would retire Betty used in this way but it will give you a fresh new stood column to attack with. Another way to get Flying Peryton could be through Burst Rough Dragon. with a GB1 you may SB1 at the beginning of your main phase to call a card from your Soul to a rear-guard circle and then put it back at the end of the turn. Also when he is placed on the Vanguard circle you may CB1 and SB1 to choose a Grade 2 from your Soul and place it on a rear-guard circle. The second ability isn’t Magia so it stays there and you are able to Stride the same turn. Accomplished Pen and Sword Gear Hound Continues with Gear Chronicle’s Time Leap abilities. When your drive check reveals a Grade 3 and you are at GB1 you may Time Leap this unit. Making this a Grade 3 will allow for a continuous attack force on your side and if you have two of these then your opponent will be using up a lot of their hand to defend your front row. There is also a Grade 1 version of this called Becoming Cornerstone Gear Turtle. Steam Battler, Ku-bau is a Grade 3 that takes advantage of being Time Leapt (Time Leap-ed? I dunno..). When he is placed on rear-guard circle from the Bind Zone you may Counter Charge 1. He also has a Vanguard ability for when he is placed on the Vanguard circle you may CB1 and SB1 to give another unit the Time Leap ability so at the end of the battle that that unit attacked, you may Time Leap it. Just to make sure every Grade gets Time Leap Tick Tock Worker was shown to be able to Time Leap another rear-guard by going into the Soul. Hopefully they’ll make more cards that take effect in the Bind Zone so all this Time Leaping will be even more effective. Messiah has gained even more forms! Her new forms are Sacrifice Messiah who locks herself when another of your rear-guards are locked. If you do you may Counter Charge 1 and you can choose a rear-guard to give +3000 power. Being able to lock itself when something else has been locked is great for Amnesty Messiah and Excelics Messiah to gain those power boosts. 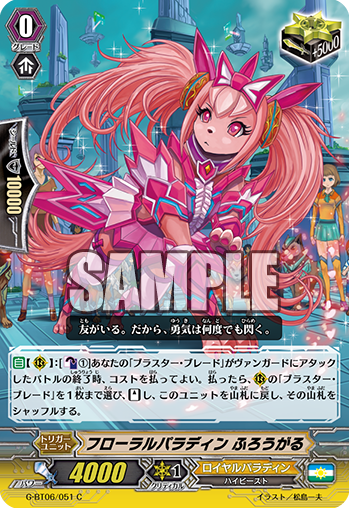 Blink Messiah is the second new Messiah who is a Heart Thump Worker clone. When your Vanguard with “Messiah” in its name attacks, you may put this into your Soul and your Vanguard gains +5000 power and you draw a card. Well, this concludes this rather large update. I have to say the thing I find the most exciting out of all of this is the new Technical Booster which is released on February 19th. I just really enjoy seeing not very supported clans getting a big boost. It’s also nice to see all these Keywords being used in the cards, it makes every clan just that little bit more different. Thank you for joining us this week and don’t forget to join us again next week for the cards revealed in the next seven days. Welcome once again to the weekly Vanguard update! We can all now take a break from the relentless spoils for Aqua Force and finally focus on the upcoming booster and trial decks. Multiple cards have been shown for Gear Chronicle, Link Joker, Narukami, and Pale Moon. You may remember this little fella from an older update. 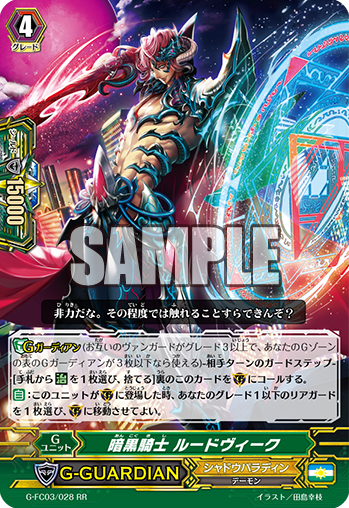 Chrono Dran has been revealed to be in the next trial deck and not only had his skill shown but also the fact that he has two races (Gear Dragon and Zodiac Time Beast), though it is not yet clear if having two races will have any significance to the actual game. 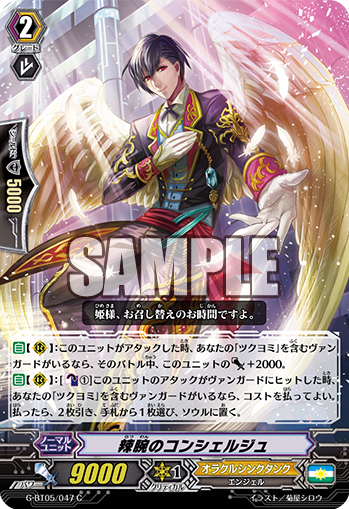 With a Generation Break 1, when Chrono Dran is put into the bind zone from a rear-guard circle you may instead put him into your soul to superior call a Grade 3 with “Chronojet” in it’s name from your deck. Then at the end of your turn you put the newly called unit into your hand. This allows for a strong column and something to ride or stride with next turn. You may be wondering “If I’m not against Nubatama then how am I going to get Chrono Dran into the bind zone from rear-guard?” Well there’s no need to worry about that! Introducing the new Time Leap ability! We were first graced with the knowledge of this ability through the new stride unit from the next trial deck, Interdimensional Beast, Metallica Phoenix. By having a “Chronojet” heart and a G Persona Blast, the Time Leap comes into action. You may choose one of your rear-guards and put it into the bind zone. If you do, search your deck for a unit with a Grade that is greater than the unit you bound by one and call it to a rear-guard circle. At the end of the turn you must put the new unit to the bottom of your deck and call the bound unit back onto a rear-guard circle. This will work great for all sorts of on-call abilities and will allow for more cards to have on-bind abilities like Chrono Dran’s. 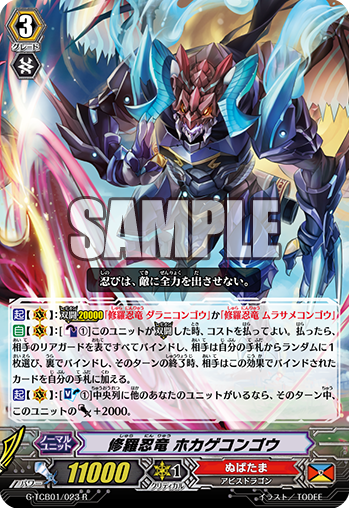 Speaking of on-call abilities, today Clock Fencer Dragon was revealed for G-BT05. 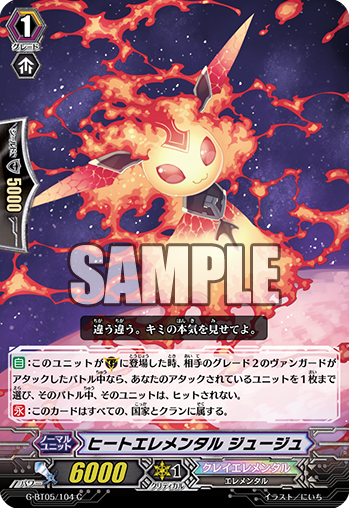 He is the first Grade 2 RRR we’ve had in a main booster for quite some time and shares the Time Leap ability that Metallica Phoenix has. He has no cost for his ability but it will only take effect if you have Generation Break 1. He is called from hand, so you can’t make uber Time Leap combos for now. Unlike Metallica Phoenix, Clock Fencer isn’t “Chronojet” specific, so if you’re someone who uses Gear Chronicle but not Chronojet, you can still pull off Time Leap. 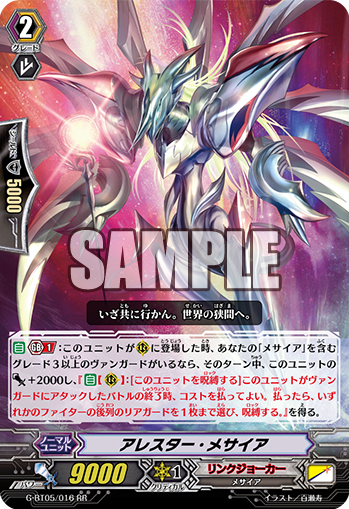 There is also a Grade 1 version of Clock Fencer Dragon that comes in the new trial deck called Timebreak Dragon. These two cards also help with Steam Maiden, Melian-Na who also comes in the trial deck. She’s a 9k Grade 2 that, with a Generation Break 1 and when placed on the field, gains 4k power. With a 8k Grade 1 behind her, she can get up to 21k power which is nothing to sniff at. With the help of Time Leap you will be able to easily bring her out many times in a game and have her gain the extra power. Another unit that benefits from Time Leap is the promo Steam Maiden, Lacina-Ber. When she is put into the bind zone from a rear-guard circle, you can put one of your opponent’s units at the bottom of their deck. This is great seeing as the ability itself costs nothing! Hopefully we can see this promo come in English very soon. I’m glad to see Gear Chronicle getting Time Leap – to me it finally makes them unique. Before now I saw them as being very similar to Kagero, but I feel like they have now made their own place in the game, and I’m always happy to see more use of the bind zone. Excelics isn’t the only new Messiah on the block! We also get a new Grade 2 Messiah, Arrestor Messiah. When Arrestor is placed on a rear-guard circle, while you have a Generation Break 1, she gains +2k power and the ability to lock herself when she attacks to then lock a back-row unit on either yours or your opponent’s side of the field. This can really help Excelics to power up your whole field or retiring your opponents units by unlocking them. Another good choice would be to just leave your opponent’s rear-guards locked to limit their actions in the next turn, though if they have a small amount of cards in hand then retiring them can be equally as bad for them. 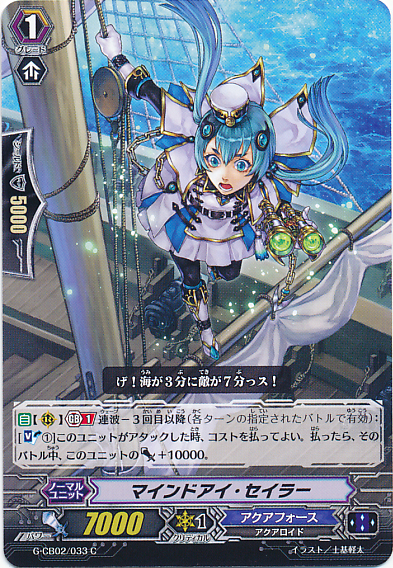 Lady Battler of the White Dwarf is getting a reprint in G-BT05 and will be able to unlock Arrestor for even more attacks. This card helps the new Messiah build a lot and can be used well with units like Neon Messiah and Awaking Messiah. If she unlocks a unit she becomes an 11k booster, so she could also boost Arrestor for an easy 22k column. 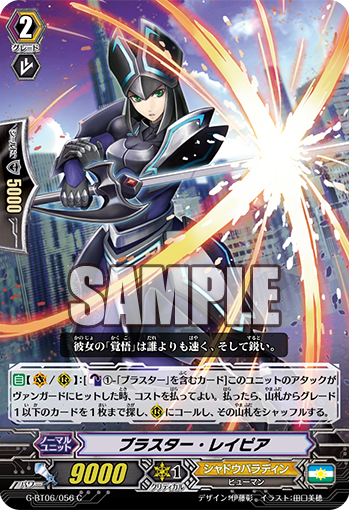 Dragonic Vanquisher has received some more support in this next set in the form of a Grade 1 and 2, both with a Generation Break 1. The first one I will talk about is the Grade 2, Rock Climb Dragoon. Rock Climb is a Glimmer Breath clone – when he’s placed on a rear-guard circle and you have a Vanguard with “Vanquisher” in its name, you may Counter Blast and Soul Blast 1 to have your opponent choose one of their rear-guards then retire and then bind that unit, after which Rock Climb will gain 2000 power. This card will definitely help with the Thunder Strike keyword to fill up the bind zone and if you’re using Rising Phoenix then this card will make up for lost power, though they may be fighting over who gets the soul. The Grade 1 Vanquisher support, Chain Bolt Dragoon, works really well with Rock Climb. Chain Bolt’s ability takes effect when one of your opponent’s rear-guards is retired due to the effect of one of your cards and if you have a “Vanquisher” Vanguard, once that’s happened your opponent must bind a card from their drop zone and you can choose one of your other rear-guards and give them +2k power. This only takes effect once per turn, but still, poor Granblue… Hopefully we will see Granblue get some bind zone abilities to make up for this abuse they have been given. Lastly we get some more Pale Moon units from G-BT05. Hell’s Gate Magician is Pale Moon’s Starlight Violinist clone. When he is placed on Vanguard circle or rear-guard circle you can Counter Blast and Soul Blast 1 to choose a Grade 2 or less from your soul, move it to a rear-guard circle and give it +5k power. This is Magia so at the end of the turn you must put that unit back into your soul. This unit is a Grade 2 with only 8000 power but due to the lack of Generation Break, you can use him early on in the game and use him on the Vanguard circle. Being a Magia, you can get him on the rear-guard circle using cards like Moonlight Melody Tamer, Betty. To bolster Hell’s Gate Magician’s power Fire Ring Wyvern is an 6k Grade 1 that can boost a Magia unit for 11k power, putting Hell’s Gate at 19000 power! This can also get Harri to 22k power and if they make a Magia 11k attacker or 12k attacker then you’re still going in for over 20k. Fire Ring Wyvern can easily allow for Pale Moon to gain some very strong columns. Fire Ring Wyvern also doesn’t have Generation Break, allowing you to hit your opponents hard and fast. This concludes this weeks update! Although I do enjoy Clan Boosters I do prefer to see a nice mix of clans, and look! No United Sanctuary! You’ve changed, Bushiroad. Joking aside I do actually hope we see some United Sanctuary next week so we can get a good glimpse of the Magus cards. We should see some in this weeks episode so the chances are good that we’ll get some good skills spoiled. Thank you for joining us this week and don’t forget to join us again next week for the cards revealed in the next seven days.